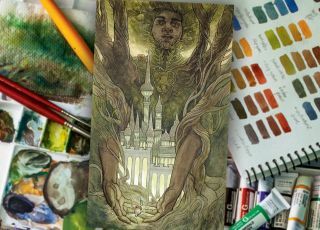 Tips from a leading artist on how to design and paint an original tarot design in watercolour. When I received my first tarot deck, I was enchanted by the beautiful artwork and the stories that accompanied every card. It became a source of inspiration for me, and I started creating my own deck: the Blood Moon Tarot. The concept attached to each card is an integral part of the tarot. I find that many decks stick close to the imagery found in the familiar Waite-Smith Tarot, but for my own deck I wanted to explore the meaning of each card, relate the meaning to my own experiences, and then use my experience to create my own symbols and a unique view of the card. For this workshop I'll be painting The Emperor. I'll walk you through the steps I take to create the card art. Tarot decks can vary in size; for my own I chose to stick with typical tarot card dimensions – about 3x5 inches. Though I primarily work in watercolour, you'll see that sometimes I incorporate acryla-gouache, ink and crayons. Each card is a new problem to solve, and by staying open to a variety of solutions I've discovered new mediums and painting techniques during the creation of the deck. Each tarot card has a specific meaning, so my first step is to research interpretations of the card, brainstorm my own ideas and connections to the concept, and create thumbnail sketches. For the Emperor I ended up relating my personal ideas of foundation and protection to oak trees in the forest. He's a solid oak tree growing in the forest: difficult to sway, impossible to move, but a fortress for thousands of creatures that he shelters with strong limbs and tough bark. Each year when autumn turns he lays plans for other leafy strongholds and tucks them away beneath the shells of many acorns. Drawing is a chaotic process for me. I like to keep my sketches messy and loose at first because it gives me a chance to find visual solutions that I may not have initially thought of. I begin with a pencil sketch, which I draw over digitally, then print out and draw over with layers of vellum until I'm satisfied. I work primarily in watercolour. Because it's a difficult medium to correct mistakes in, I prepare with colour and value studies. Studies will help me decide on a colour palette, and I can reference my studies during the painting process so I don't deviate too far from my planned intentions for the image. When I'm ready to start painting, I scan the final drawing and print it out on hotpress watercolour paper. Before I do anything else, I go over the printed linework with pencil, adding more weight to important lines and insuring the image will remain if the printer ink fades. I soak the paper with water and adhere it to a board using Kraft paper tape, which has water-activated glue on one side of it. I leave space around the drawing because I'll have to cut that tape off later. When the paper is dry I put painter's tape around the drawing, so the illustration will have clean edges. Now that the paper is stretched, I thoroughly wet it and chose one or two colours for the underpainting. These first washes are very light and I use them to tone down the white of the page in areas that will have a darker overall value. In lighter areas, such as the buildings and acorn, I keep the paper's white. Occasionally I use masking fluid when I have a lot of small areas where I want to retain the white of the paper. I make sure the paper is dry before I do this, and I use a tool that will enable me to cover the little details with the fluid. Before starting my washes, I wet the paper again. I add many loose layers of paint with a wet brush (wet on wet technique) and I create interesting texture by spraying the damp paint with water. In this step the trees and the leaves start to take shape, but I don't get too detailed. Here I use a wet brush on dry paper, layering transparent washes. I add detail to the buildings in the city, the trees and leaves, the Emperor's face and the brooch. I don't go into fine details just yet, but I get it to a point where I feel like the linework needs to be defined. Again I wait for the paint to dry completely. I then use an eraser to gently remove the frisket. I don't like to use my fingers to peel it off because I don't want to rub dirt or oils from my hands onto the paper, and it's easier to remove the small spots with an eraser. When I feel like the linework is getting lost I make a half-and-half mix of sepia and black waterproof ink. I use a very small brush to darken the lines, especially on the face, hands and other delicate details. If I want my lines to be even darker, I'll add more black ink to the mixture. From here I add energetic lines with my smallest brush using a dry brush technique, which I like because it feels similar to drawing. I add lines around the roots of the city and the acorn – I want it to feel like there's light and life flowing around that area, while other areas in the painting are more stable and still. I use acryla-gouache and a jelly roll pen to bring in highlights on the skin, city and acorn. I also flick the brush to create a small splatter effect with the paint. This looks like dust in the light, and I use the jelly roll pen to make smaller white speckles as well – closer to the acorn and window light. I take a break from the painting and give my eyes a rest. When I return it's easier to spot where adjustments are needed. Acryla-gouache is my go-to for fixing anything that I can't fix with watercolour. I also add light texture by gently using a water-soluble crayon so that it catches on the tooth of the paper. When I'm finished the painting, I remove the white tape and cut away the brown tape with a pair of scissors. To avoid any noise and make it easier to digitally remove dust, I scan the painting at 1,200dpi and make very small adjustments to the colour and value, resize the image, and then I'm done. This article originally appeared in ImagineFX issue 151; buy it here!